Думал прослушать для ознакомления, а ведь зацепило. Спасибо! оу, ребята делают приятный стоунер-хк: и воткнуть можно и порубиться, приятный релиз. скучные...и не покидает ощущение что где-то я это уже слышал - один в один. Hello, world. In a month we'll be roaming dusty roads of mother Europe once again. For some reasons, we don't travel that much, so every trip turns to be really special and significant for us. It's a chance to see new places and persons, meet good people we've set the connection with, and finally - share our music and speak out. As well, this will be a first trip for us as 5-piece posse. Previous tours were booked pretty much by ourselves, but this trip wouldn't be possible without kindest help and support from our friend Tim from Stateless Society, we own him everything. Pretty much everything that we've made as band will be available as 12'' released by Amendment Records, + we have some fresh tunes that sound really cool, so get ready. Spread this thing everywhere, keep your eyes open, stay tuned and vigorous, Kyiv Chain Gang is coming. Ух, как же хотелось услышать продолжение ставшей любимой EP Arcanum!!! 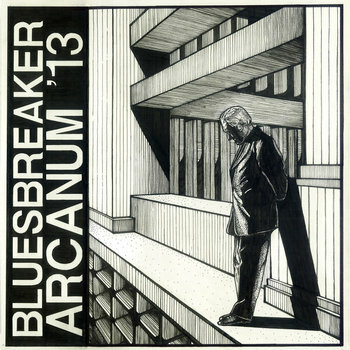 all songs were written and recorded by Bluesbreaker between 2010 and 2013.